Editorial from Down Syndrome Research and Practice, Volume 8, Issue 3.
. (2003) Editorial. 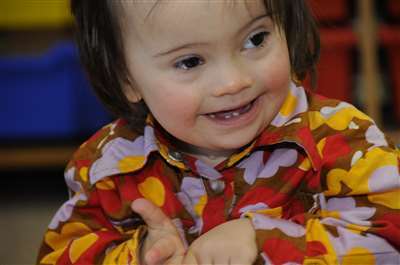 Down Syndrome Research and Practice, 8(3), -. Background. While the prevalence of obstructive sleep apnoea syndrome among children with Down syndrome is reported to vary from 30 to 50%, the nocturnal respiratory patterns of adults with Down syndrome is not well known. Objectives. The aim of this study is to evaluate sleep related breathing disorders in a sample of adults with Down syndrome. Methods. We studied the nocturnal respiratory patterns of 6 adults with Down syndrome, aged 28 to 53 years. All participants were monitored for 8 hours using a 12 channel polysomnograph. Respiratory events (apnoeic and hypopnoeic) were classified as obstructive or central, in relation to the presence or the absence of paradoxical breathing. Results. All participants had respiratory pauses during sleep. 5 of them had an apnoea hypopnoea index >10, justifying the diagnosis of sleep apnoea syndrome. About 85% of the respiratory events were apnoeic, the others being hypopnoeic. Among all the respiratory events 89.2% were obstructive, whereas only 10.8% were central. The central events were almost always organised in very low and regular sequences and respiration frequently showed a true periodic pattern, consisting of short periods of augmented breath followed by central events causing oxygen desaturation. Conclusions. According to the literature and in conjunction with the current study's results it could be hypothesised that the nocturnal respiratory pattern of adults with Down syndrome depends on several pathogenetic factors such as age, severity of upper airway abnormalities, body mass index (BMI), other pathological conditions and age related brainstem dysfunction. Resta, O, Foschino Barbaro, M, Giliberti, T, Caratozzolo, G, Cagnazzo, M, Scarpelli, F, and Nocerino, M. (2003) Sleep related breathing disorders in adults with Down syndrome. Down Syndrome Research and Practice, 8(3), 115-120. The purpose of this study was to examine the learning of movement sequences in individuals with Down syndrome under different visual information conditions. 10 adults with Down syndrome and 14 neurologically typical adults performed a sequence of movements under two different visual information conditions: full visual feedback of the limb and environment and no visual feedback of the limb. Participants were given knowledge of results of their total movement time after each trial. The entire task was presented as a game and movement time information was given as a "score" after each trial. Participants were also given verbal encouragement throughout the task. As expected, individuals with Down syndrome had significantly slower reaction and movement times than neurologically typical participants. Interestingly, however, mean reaction and movement time was not affected by the visual condition, in either group. Participants with Down syndrome improved their performance over the presented trials, in both visual information conditions. These findings indicate that providing knowledge of results of movement performance can facilitate the performance and coordination of movement sequences even under conditions where visual information of the moving limb is restricted. Virji-Babul, N, Lloyd, J, and Van Gyn, G. (2003) Performing movement sequences with knowledge of results under different visual conditions in adults with Down syndrome. Down Syndrome Research and Practice, 8(3), 110-114. Increasingly, children with Down syndrome receive literacy instruction with the expectation of acquiring functional reading skills. Unfortunately, little is known about the processes underlying literacy skills in this special population. Phonological awareness contributes to literacy development in typically developing children, however, there is inconclusive evidence about these skills in younger children with Down syndrome. 9 children with Down syndrome (5;6 - 8;10 years) participated in this investigation. Due to the paucity of standardised phonological awareness measures for children with special needs, in particular children with Down syndrome, a variety of tasks were adapted from the literature. The assessment battery examined the skills of phonological awareness, literacy, speech production, expressive language, hearing acuity, speech perception, and auditory visual memory. 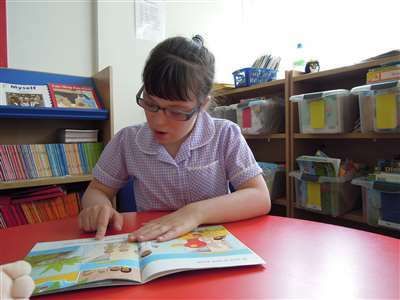 The results suggest that children with Down syndrome are at risk for reading acquisition difficulties due to reduced phonological awareness skills. These deficits are in addition to delays caused by reduced cognitive skills. Only one of the participants was able to demonstrate rhyme awareness, which may have been due to task effects. Written word recognition ability was correlated with tests of phonemic awareness, and error analysis of the spelling and nonword reading tasks suggested grapheme phoneme connections deficits. Further research is needed to determine the best methods of assessment and intervention for phonological awareness in children with Down syndrome. Kennedy, E, and Flynn, M. (2003) Early phonological awareness and reading skills in children with Down syndrome. Down Syndrome Research and Practice, 8(3), 100-109. A fifteen year follow up of the linguistic and cognitive profile of a woman, named Françoise, with standard trisomy 21. She had been studied in considerable detail between 1987 and 1991 by Rondal (1995) and found to have exceptionally good language abilities in advance of regular cognitive abilities for a person with Down syndrome. Françoise's psychological functioning has been deteriorating relatively rapidly over the last two years. A severe deterioration of her previously excellent receptive language abilities is documented in the present study. Productively, her online word finding is becoming problematic, mean length of utterance has halved compared with 15 years ago, and production of compound sentences is reduced. However, basic phonological and morphosyntactic skills are preserved. Françoise's changing profile during the latter years seems to mirror that documented in the first stages of Alzheimer disease in ageing adults in the general population. Rondal, J, Elbouz, Ylieff, and Docquier. (2002) Françoise, a fifteen year follow up. Down Syndrome Research and Practice, 8(3), 89-99.